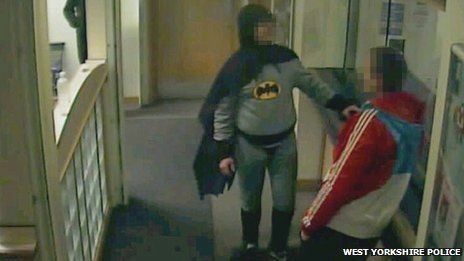 A man dressed as the caped crusader Batman has handed over a wanted man at a Bradford police station before disappearing into the night. Police said the costumed crime-fighter marched the 27-year-old man into Trafalgar House Police Station in the early hours of 25 February. The man was charged with handling stolen goods and fraud offences. As you can see from the photo, Mr. Wayne has let himself go physically, but his dedication to fighting crime remains unabated.